Heroes, Heroines, and History: Rains Are Still Pouring Down! Rains Are Still Pouring Down! Last month, we took a trip back to the Great Depression and life on Chincoteague Island, with a few little nuggets about my grandfather and how he and his family survived on a tiny little island. If you missed that post, you can read it here: http://www.hhhistory.com/2016/10/island-life-during-great-depression.html. This month, we'll cover another occurrence which drastically affects life on the island -- flooding. For those who don't know, Delmarva is named for the 3 states which make up the land associated with the peninsula: DELaware, MARyland, and VirginiA. I didn't see any other way to make my point without coming right out and asking what states make up the Delmarva Peninsula. So, I did. From some, I received blank looks, from others, I heard Virginia and Maryland for sure. This truly surprised me. Delaware is not only 1 of 3 states making up the peninsula, but it occupies 60% of the land area as well. For someone living on the peninsula to not know where Delaware is, well that's a sad testament of the lack of geographic education across the US. So many overlook this tiny little state and its significance. And the same goes for the weather patterns which pass over this area. Quite often, hurricanes will take a path up the Eastern coastline, and when they approach the mid-Atlantic area, reports will address Virginia and New Jersey and New York but skip over Delaware and the Delmarva Peninsula. However, record-breaking flooding levels have been reported from this area following destructive hurricanes in history. With the way the weather patterns run, hurricanes enter from the southeast and collide with fronts coming from the northwest which lead to circular rainfall that stagnates and becomes stationary over the peninsula. Historically speaking, these storms have affected things like ships avoiding the British blockade of the Chesapeake Bay during the Revolutionary War. Smugglers would travel to the mainland via the Chincoteague harbor, then unload their goods and move them further south toward more populated areas. 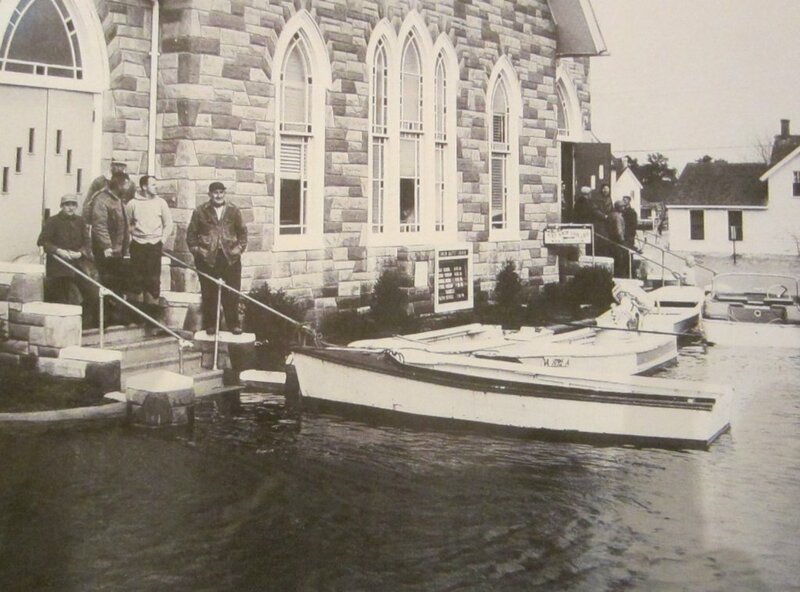 During the late summer, many years would find a good bit of the lower peninsula under water, so transporting goods became a significant challenge, especially with the pathways resembling a marshland than dry ground. 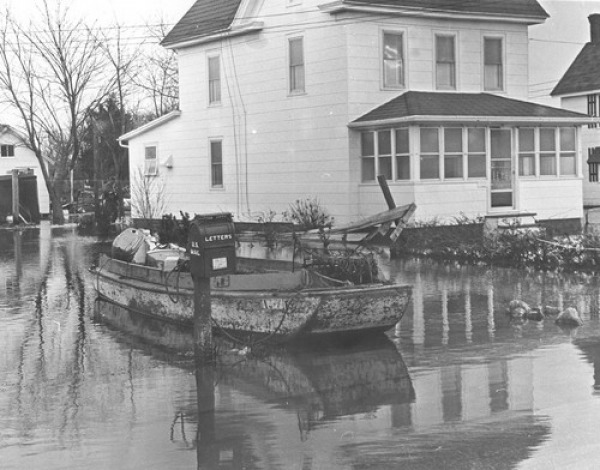 On Chincoteague Island, flooding is a reality the residents face each and every year. I remember visiting more often in my younger years, and if we were there in the later summer, we were rolling up our pant legs and kicking off our shoes and socks to wade in the waters that could rise as much as hip-high. On particularly stormy days or weeks in days gone by, residents of the island kept little boats handy and used them to navigate the streets. Can you imagine that? Getting dressed and hopping in a boat to go to Sunday meeting? Some might be enamored with the idea of Venice, Italy with its gondolas and waterways throughout the city, but I'm not sure I'd be too fond of living like that every day...or even dealing with that as part of my reality each year. Sure, there's a certain level of "adventure" attached to travel and getting around during the flooding, but as it's been shown more than once, flooding can also come with devastating effects leading to complete destruction of buildings and structures, and many deaths and injuries. Because of this reality, a lot of the homes and buildings on Chincoteague are built several feet above ground level with a raised foundation and steps leading to the main floor from the ground. Much like beachfront properties along the coastline will raise the homes on pillars and stilt-like poles, following the destruction of homes on the island, rebuilds would modify the foundation to allow for flooding and help prevent future damage at the main floor level. Nevertheless, the pouring rains and the location of the peninsula lend to very wet seasons most of the time. 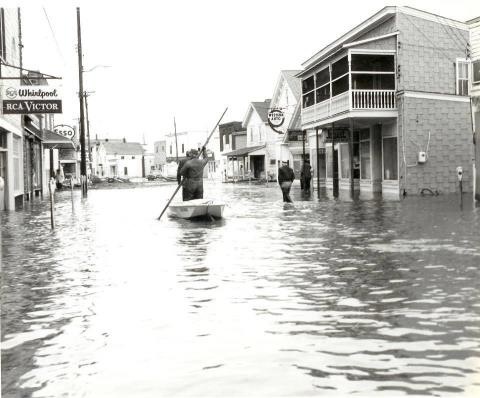 While I spent most of this post talking about summer storms, there have also been times when high tides meet winter storms and you have snow on the ground mixed with flooding in the streets. Quite the contrast causing floating ice and frozen sheets of water on the ground! * Have you ever been in the path of a hurricane, or had to evacuate as the result of the flooding and damage caused by one? * Have you ever misjudged flooding while driving a car? What would you do if you encountered flooding while driving a horse and buggy? How does the threat of flooding change from the past compared to modern day? * Would you still attend Pony Penning Day even in the midst of flooding or torrential downpours? Why or why not? Leave answers to these questions or any comments on the post below. Next month, I'll do a themed post to wrap up the year and share some Christmas traditions on Chincoteague Island. Come back on the 9th of December to find out more. Oh Wow! What a great post. I had no idea about this. The closest I came to flooding, was one year the entire town of Willows, CA(a town that is lucky to see rain most years) was surrounded by flood water. We were basically an island for about 3 weeks. Where I live now, Redding CA, we get some rain, but nothing too bad. Our danger is in fire season. 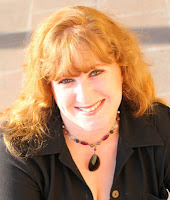 I look forward to your next post! Any natural disaster can be frightening. Living in Colorado now, we definitely don't face much danger of flooding (beyond specific areas near rivers during the rainy season), but we also face the fire danger due to the semi-arid conditions and winds. Have had 3 major fires right around us in recent years. I love your posts on Chincoteague Island! Wow, never knew about the flooding and I'm sure it would get old fast. An adventure at first, but then I'd be sick of the wet everywhere. I have never been in the path of a hurricane because I live in Michigan - but I sure do watch the news when one comes past the East coast. We don't have much danger of anything here in MI. Maybe a tornado, maybe some flooding, mostly just severe storms are what we have to worry about. Susan, so good to hear you're enjoying these posts about Chincoteague. It's been a lot of fun doing the added research for them and almost taking a step back in time. :) I'm with you on the wet everywhere. The adventure would be the initial reaction, but every year? And of course, the knee-deep or greater levels don't occur every year, but there is flooding of some sort. Here in Colorado, we don't have much danger, but there are chances of wildfires, blizzards, and hailstorms. Most of those are hit or miss, and they're not frequent. With 300 days of sunshine each year, I've adapted. Lol! An informative post about Chincoteague Island. I've never been in the path of a hurricane living in Illinois. I haven't personally been effected by flooding but have seen the devastation of flooding especially to farm land.